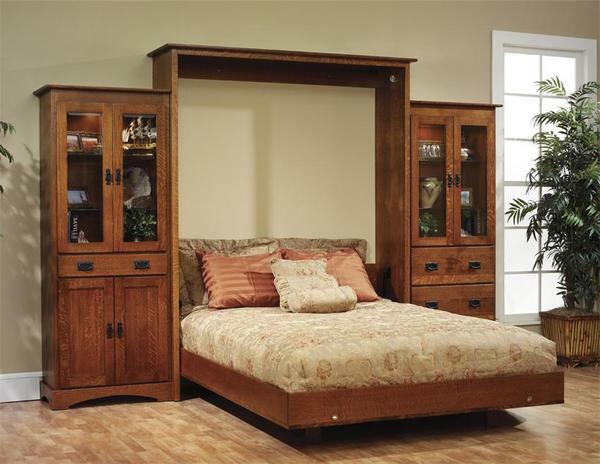 At DutchCrafters we are proud to offer a Murphy Wall Bed Collection! The Murphy Bed was invented in the early 1900s by William L. Murphy and has remained popular to this day. Our hidden bed designs are not built anymore by Mr. Murphy but by an Amish woodworker, Mr. Miller. Murphy Beds are very popular in Urban areas such as New York City where apartment and studio living are the norm. A Murphy Bed is a logical choice when space is limited. Many businesses such as hospitals, college dorm rooms and hotels, take advantage of these space-saving Murphy beds. DutchCrafters Mission Murphy Wall Bed is as handsome as it is well constructed. This Mission style bed is handcrafted with genuine hardwood, including solid oak, quartersawn oak, cherry, maple, eco-friendly lyptus and several other solid woods.. We do not use any veneers in the construction of our beds. Our solid wood Murphy Beds will hide away in your bedroom with the charm of custom cabinetry. With ease it can then be converted into a bed. The Mission Murphy Bed is handcrafted in twin, full and queen sizes. The Murphy Wall Bed Collection is always popular and designed to fit your space and taste. Our Murphy Wall Bed Collection is finally, an introduction to a convenient guest hospitality suite. We also offer our Louis Phillipe Murphy Bed styling. Murphy Beds are also sometimes called Wallbeds or Fold Away Beds. Our Amish Bedroom Furniture is all handcrafted from solid wood by experienced Amish craftsmen. Floor to Bottom of Side Rails: 6 1/4"
Floor to Platform (Where Mattress Sits On): 8"
The standard construction of this bed requires only a mattress - without a box spring. The Murphy Bed comes in 5 pieces which need to be assembled. Detailed instructions are provided. Mounting hardware is also provided. The Deluxe Bookcase Set contains two Amish Old English Mission 30" Bookcases with Drawers(Pictured with cabinets, call to order), Cedar Drawer Bottoms, Full Extension Undermount Soft-Close Drawer Slides, Dust Panels between drawers, and Touch Control for the Lighting.